In order to figure out how many MCS CD Generation Chemical (packs) are necessary for one decontamination; Multiply the BSC volume by 0.13 g/ft3 (4.7 g/m3) to determine the mass of ClO2 required to be generated. 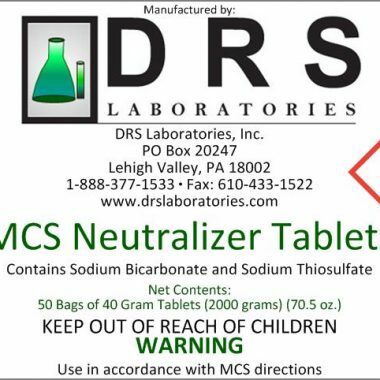 Use the following table to determine the amount of tablets required. 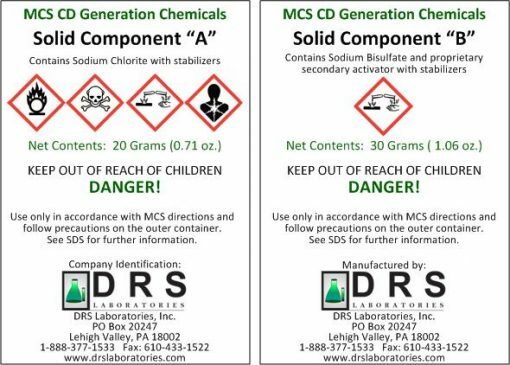 What is the shelf life for MCS CD Generation Chemicals? Two years from the date of manufacture. What is the recommended temperature for storage of the MCS CD Generation Chemicals? Controlled room temperature is the preferred storage condition (60-85 deg F), since that is the temperature on which the shelf life is based on. The CD tablets have been stored for 6 months at 50 deg C (120 deg F) without deterioration. Similar tablet formulations have been stored for 6 months at 60 deg C (140 deg F) without deterioration. We have not tested storage at temperatures below room temperature, but we don’t see a failure mechanism there. Are there any DOT travel restrictions on keeping the tablets in a van or other vehicles? In the configurations we sell the MCS CD Generation Chemicals, they are considered a Small Quantity Exception under 49CFR 173.4, basically making them exempt from the regulations. Are there any restrictions to the quantity of MCS CD Generation Chemicals kept in a van?